Strange Attractor is a dynamic multi-dimensional series of collaborative ventures between five artists, Anthony Kelly, Danny McCarthy, Irene Murphy, Mick O’Shea and David Stalling and guests. During the residency the artists will work both as a group and as individuals using improvisational sound performance, experimentation with technology and combined media to explore creative possibilities resulting in an experience that offers multiple points of entry for the audience. The residency will further develop the sound and visual possibilities already explored in the monthly performances by using sound installation, still and moving image, video documentation, and ‘informal’ performances and live events in the various spaces of Crawford Art Gallery. 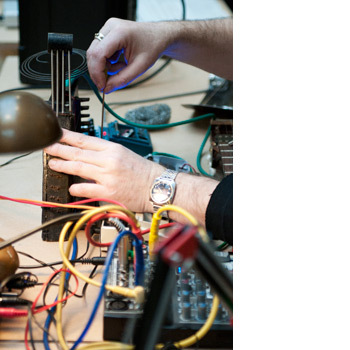 Strange Attractor, began in November 2010, with a highly sucessful series of monthly four hour durational sound performances inviting international guests including David Toop & Mary Nunan, Stephen Vitiello, Alessandro Bosetti and Rhodri Davies. The live performances open new cross-disciplinary relationships between sound, visual art, music and choreography, and have attracted large audiences who have experienced with the artists developing sound and visual possibilities. A catalogue and DVD will be published concluding the residency. DANNY McCARTHY is one of Ireland’s pioneers of performance art and sound art and he continues to be a leading exponent exhibiting and performing both in Ireland and internationally. In 2006, he founded the Quiet Club with Mick O’Shea, a floating membership sound (art and electronics) performance group. A book + CD on his work entitled “LISTEN hEAR” was recently published by Farpoint Recordings to coinside with his exhibition “Listening With The Sound Turned Off”. MICK O’SHEA works spring from his essential experience in drawing. In 2006 he formed The Quiet Club with Danny McCarthy to promote and showcase improvised music and soundworks. In 2003 O’Shea , Stephen Brandes and Irene Murphy set up the collaborative practice, The Domestic Godless which, through performative cooking events, explores culinary activity as art practice and tests assumptions about the cultural traditions of food in challenging and often irreverent and absurdist ways. IRENE MURPHY’s work questions the role of the artist, creative space, and engages with a broader concept of creativity. A common link in her art are ideas about performativeness, site specificity and communality with Murphy’s art acts being private interventions into public space. She is active in initiating many collaborative projects such as The YOYO Club, Ideal State Agency, Electric Rain and the creative food trio The Domestic Godless. ANTHONY KELLY & DAVID STALLING have been collaborating on a series of sound and visual works since 2003. Their work encompasses a shared practice of recycling ‘objets trouveés’ of sound, visual and text material in their ongoing collaborative sessions. In 2005 they founded the sound art label Farpoint Recordings.